Cadence was born on the streets to a single, homeless mother and by the time she was three entered foster care due to extreme neglect, violence and malnutrition. Hope Reins, Holly thought, might be a pivotal support system for Cadence to make deeper connections because of the open, natural settings, horses and uplifting Christian foundation. 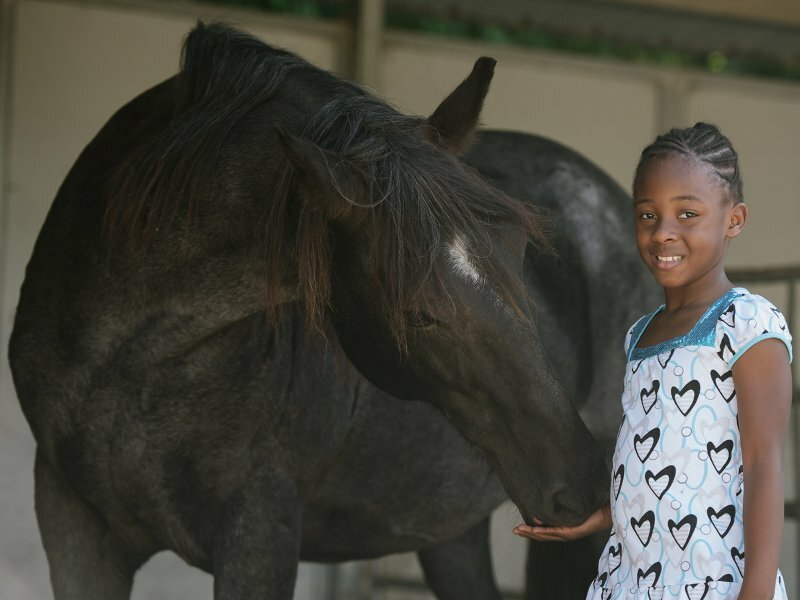 It was here she met Ruka, our beautiful black draft horse who shared a painful past of starvation and abuse as well. Caitlyn, Cadence’s session leader, explained how Ruka was still willing to trust people despite everything the mare had been through. According to Holly, Cadence first said the words, ‘I love you,’ to Ruka – something she’d never, ever been able to say to her, Brad or anyone. Would you consider committing to a $25 monthly sponsorship, making a onetime donation, or signing up to serve at the ranch?